Advent is a time of waiting–for the incarnation, for justice, for peace. Over the centuries the church has developed a series of measures to help us develop the practice of waiting, everything from different liturgical colors to candles and wreathes to calendars with little doors to special music (though it’s an unfair fight: for every O Come, O Come, Emmanuel there are a slug of Christmas carols). In this social media age, these disciplines take on new forms. Thus Sophia Agtarap, a woman with overdeveloped thumbs who has the creatively obscure title of Minister of Online Engagement at United Methodist Communications, came up with a open challenge to everyone within tweeting range to participate in sharing a different photo each day all the way through Advent to Christmas day. You could place the images on Facebook or Twitter or Pinterest or whatever. She chose a different theme for each day, and each image–in theory–would reflect that concept. The series of images and themes would then inspire us, or so she thought, to reflect more deeply on Advent and thus be better prepared for truly celebrating Christmas. I confess it sounded a bit gimmicky, but I was intrigued. I was at home the first few days so it was easy to pick out some images and post them on Facebook with the appropriate hashtags, #rethinkchurch and #rethinkchristmas. Then I headed off to Mexico for a couple of weeks and planned on forgetting the whole business, but by then it had stuck. Even while on assignment in Oaxaca and Chiapas, with little time for such foolishness, I found myself looking up the next day’s theme, then letting it bounce around inside my head. The discipline had taken on a power of its own. Perhaps that’s why we have disciplines. Thus waiting became a more intentional, conscious, and aware practice than it would otherwise have been. So here are my choices for this Advent. Twenty-five images from 17 countries, all places where people are in some way waiting. As we approach the end of our wait, I’m more ready for the incarnation. Come, Emmanuel. Day One: Go. 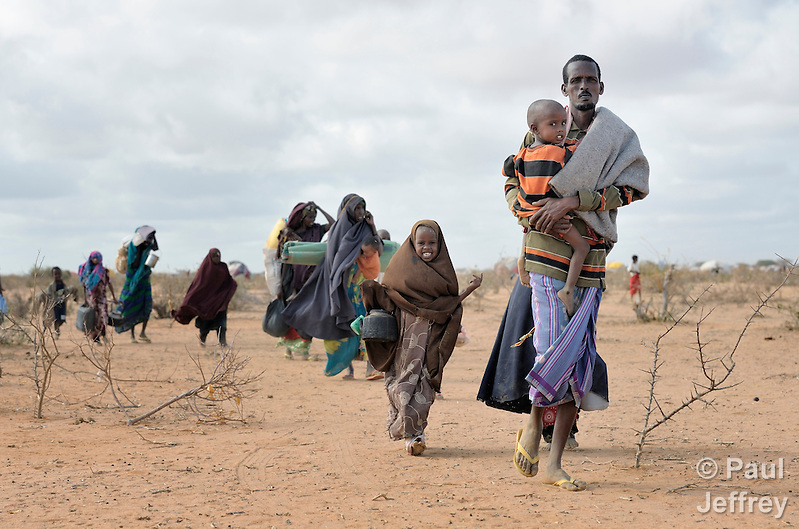 Refugees flee Somalia for Dadaab, the world’s largest refugee complex in Kenya. Day Two: Bound. 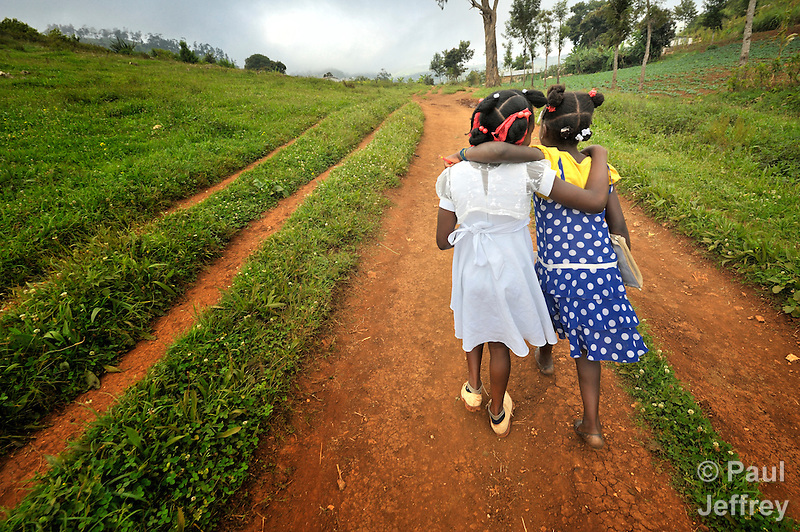 Two girls on their way to school in the Haitian mountain village of Foret des Pines. Day Three: Peace. Jasmina Jahic, a landmine survivor in Bosnia, gets help with her prosthetic leg from her 5-year old son Eldar. Day Four: Time. 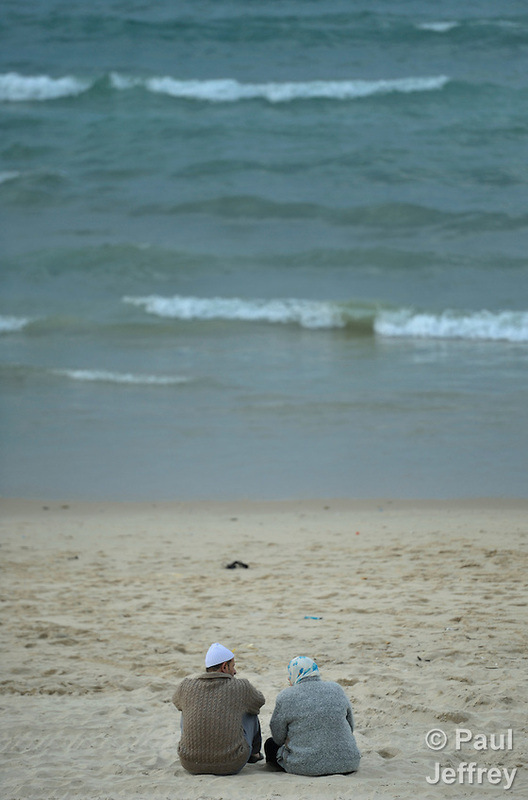 The future of their tiny territory uncertain, an older couple sits on the sand of the beach in Gaza, staring out to a sea that is no longer theirs. Day Five: Flood. 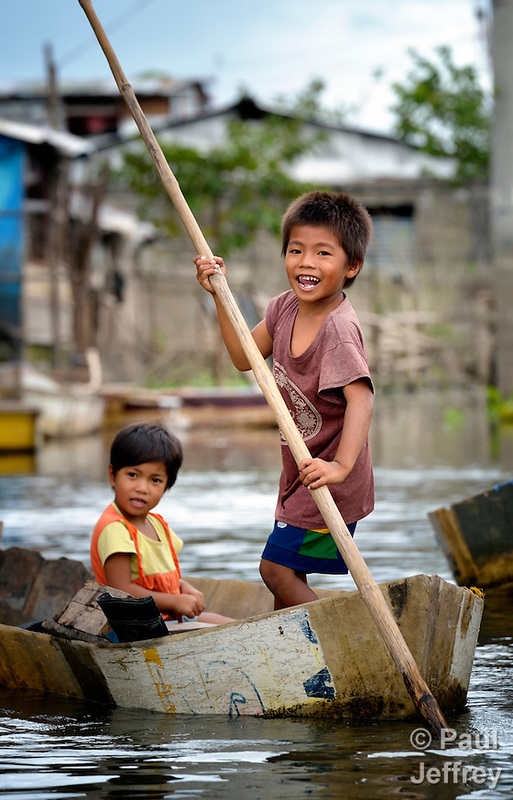 A boy uses a pole to push a boat along a flooded street in Biñan, Laguna, in the Philippines. Day Six: Awake. 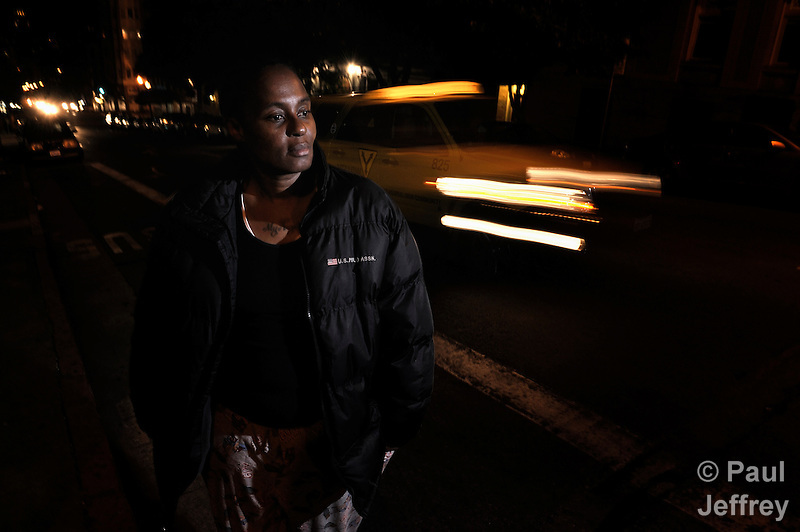 Juanita Baptiste is a resident of the Mary Elizabeth Inn, which provides safe and permanent housing in San Francisco for women who were homeless or survivors of domestic violence. Many of the women, while homeless, stayed awake out of fear all night long. Day Seven: Ready. Dana Karim, a 7-year old refugee girl whose family came from the Darfur region of Sudan, puts on her shoes as she gets ready for school in the family’s crowded apartment in Cairo, Egypt. Day Eight: Wisdom. 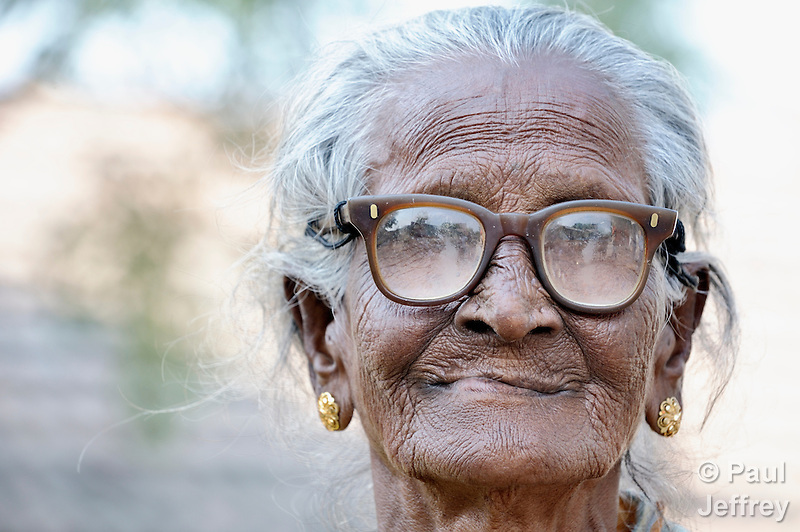 An old woman in Natham, a small town in the southern India state of Tamil Nadu. Day Nine: Delight. A child plays in the rain in the Doro refugee camp in South Sudan’s Upper Nile State. Day Ten: Holy. Tran Van Son (right) is a carpenter in Bo Trach, Vietnam, who lost his legs to a landmine from the U.S. war against Vietnam. 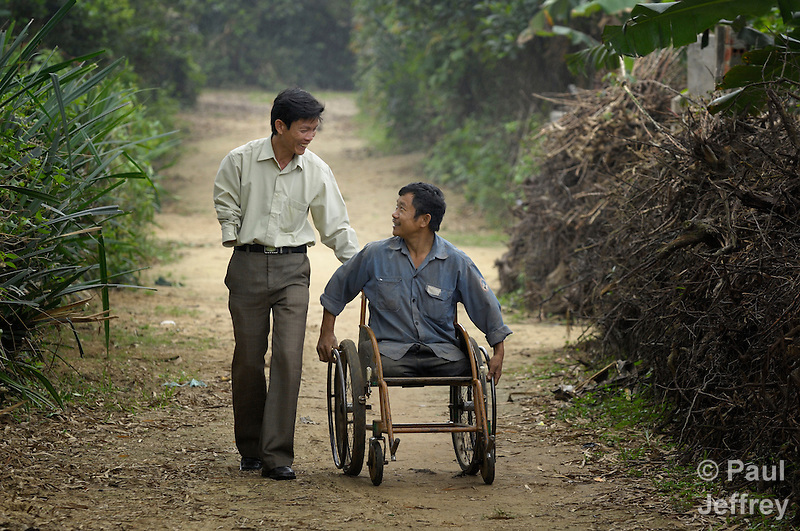 Here he travels along a path near his home with Hoang Van Luu, who lost an arm to a landmine. Day 11: Steady. 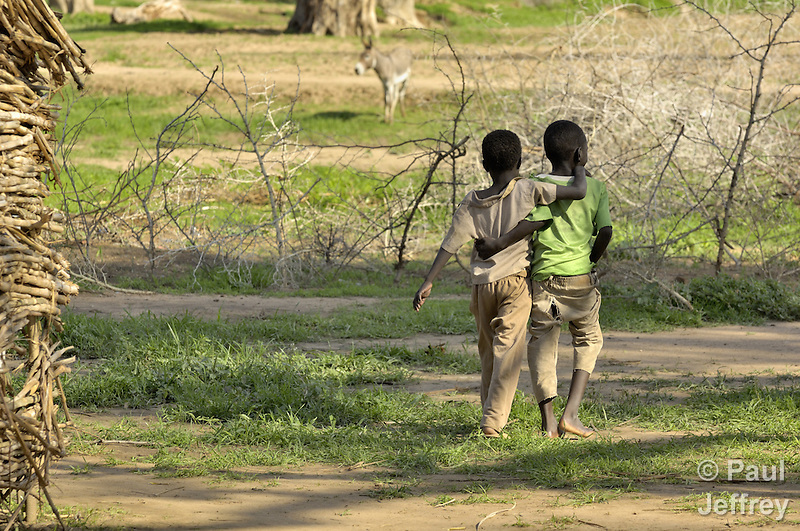 Children in a camp for internally displaced people outside Kubum, in the violence-wracked Darfur region of Sudan. Day 12: Hope. 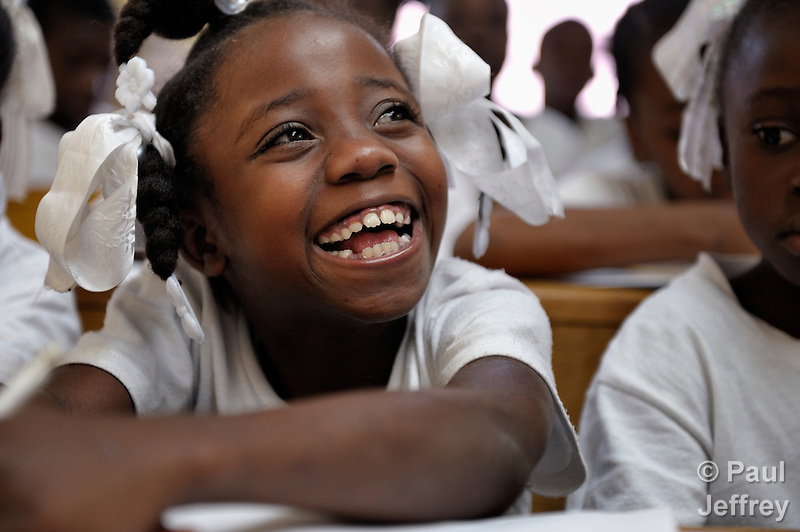 A girl in class at the “House of Hope,” a community-based educational training program in Port-au-Prince, Haiti, for children performing domestic work (so-called ‘restaveks’), supported by Church World Service. Participants in the program also include former gang members and teenage mothers. Many rights activists consider the use of restaveks to be a modern form of slavery. Day 13: Justice. 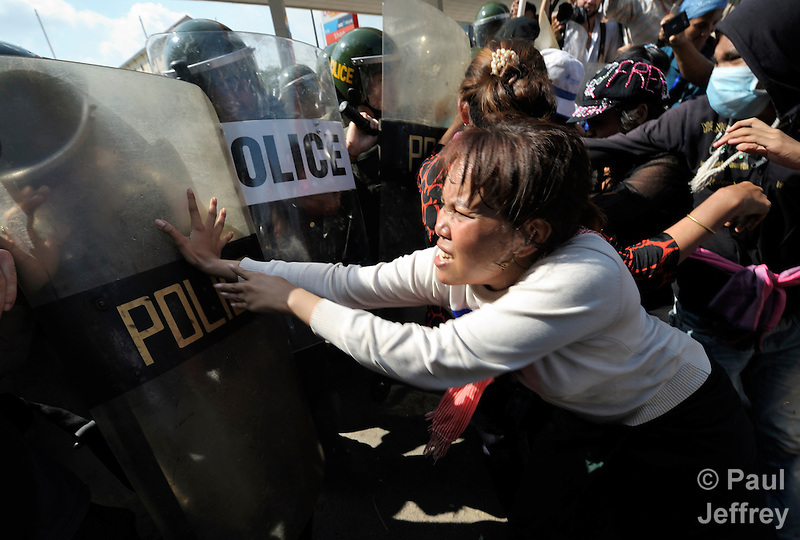 A woman demonstrator pushes back at police as displaced residents of Boeung Lake in Phnom Penh, who were left homeless after the government allowed a private developer to move them out and fill in the lake, attempt to protest in the Cambodian capital. Day 14: Gather. 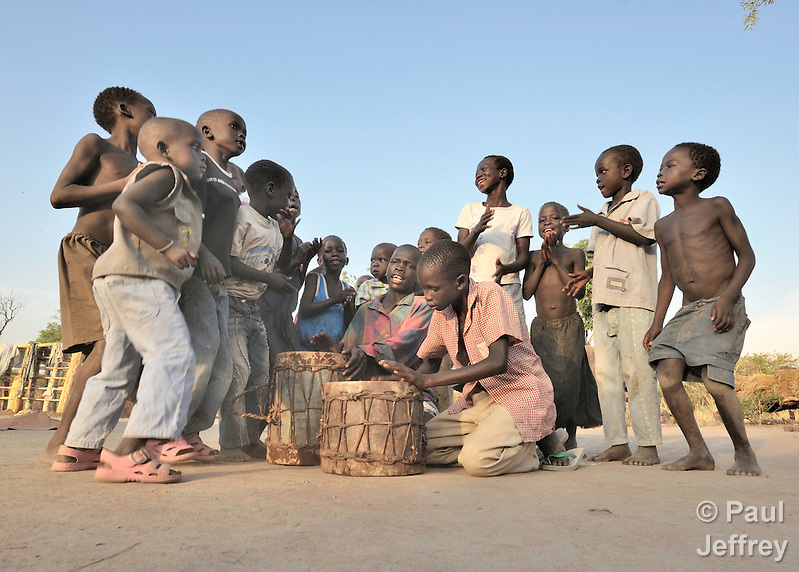 Children gather to sing and dance in the South Sudan village of Yondoru. Day 15: Rejoice. 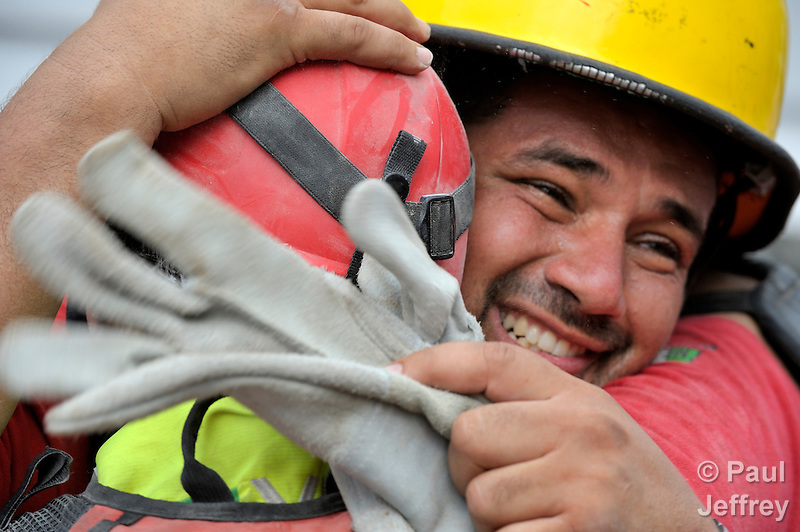 Oscar Oliva, a member of a Mexican search and rescue team, cries with joy on January 19, 2010, as he embraces a fellow rescuer after the group pulled 70-year old Ena Zizi from the rubble of Haiti’s devastating earthquake, exactly one week after much of the city was reduced to ruins. Day 16: Strong. 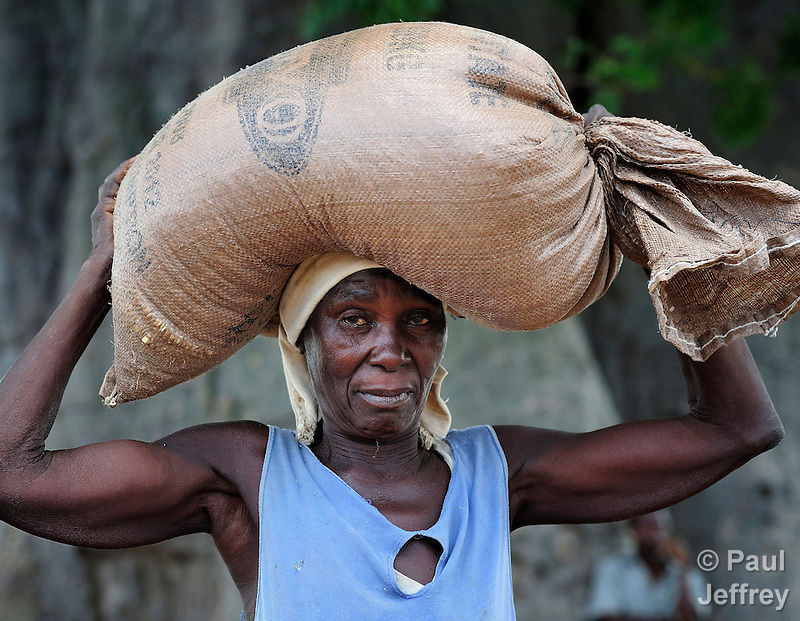 Alefa Soloti carries a 50 kilogram bag of corn in Dickson, a village in southern Malawi that has been hard hit by drought in recent years, leading to chronic food insecurity, especially during the “hunger season” when farmers are waiting for the harvest. Day 17: Free. Holding her baby, a woman writes on the blackboard as she participates in an adult literacy class in the village of Magsaysay, in New Bataan in the Compostela Valley on Mindanao Island in the southern Philippines. Day 18: Mercy. A feeding tube helps a malnourished child hang on to life in the stabilization ward of the Ifo Camp Hospital in the Dadaab refugee complex in northeastern Kenya. Day 19: Patience. 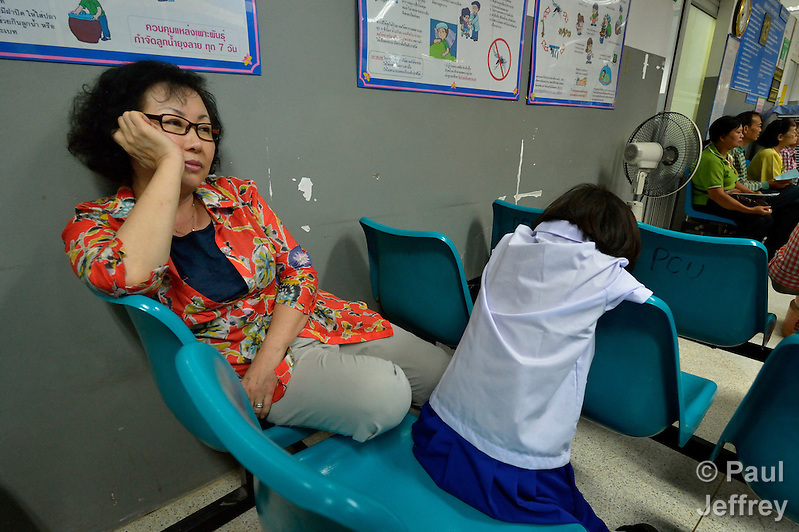 United Methodist missionary Cindy Moon waits with 9-year old Play Nata to see a dentist in Chiang Mai, Thailand. The girl is an HIV positive orphan, one of eight such girls that lives in an orphanage directed by Moon and her husband Gary. Day 20: Good News. 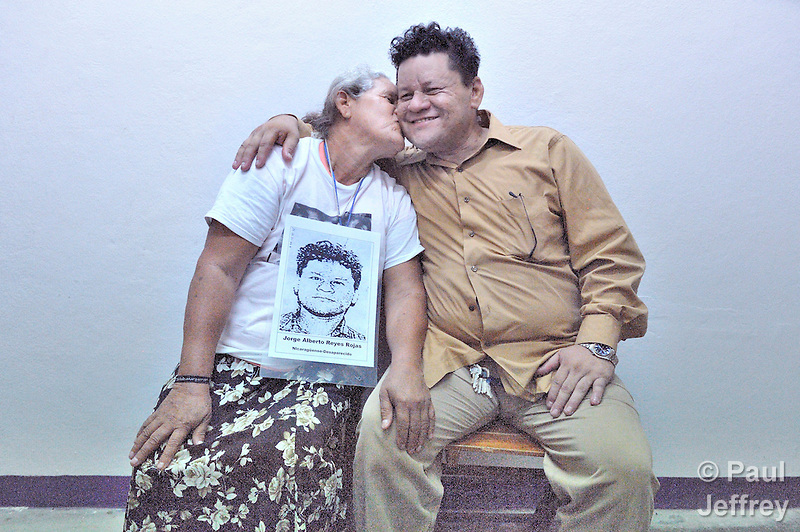 Santos del Socorro Rojas kisses her son Jorge Alberto Reyes Dávila, with whom she was reunited on December 16, 2013, in Tapachula, Mexico, after nine years of separation. Day 21: Prophet. 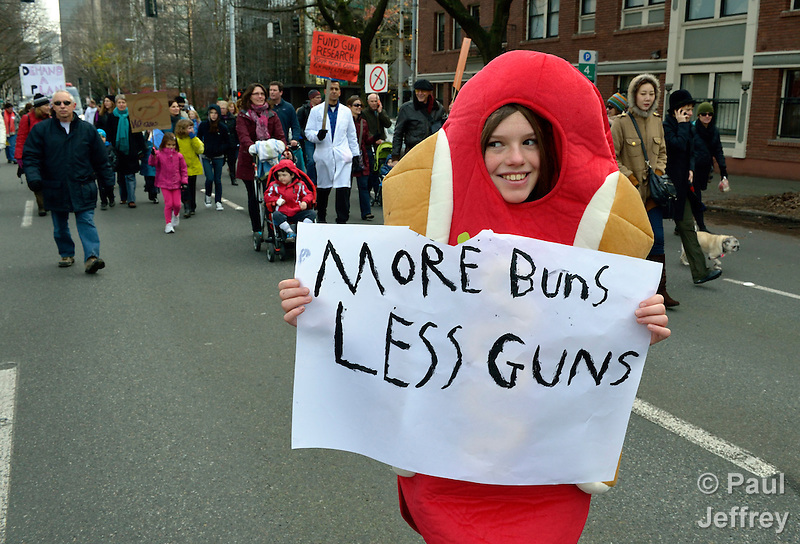 A creatively-dressed girl among hundreds of Seattle residents who demonstrated in favor of stricter regulations of firearms. Day 22: Sign. 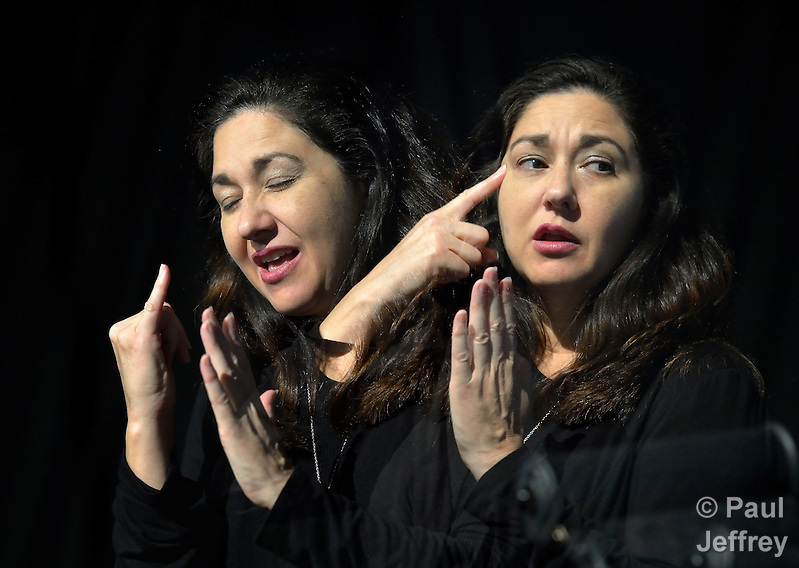 A double exposure of American Sign Language interpreter Michelle Menefee. Day 23: Neighbors. 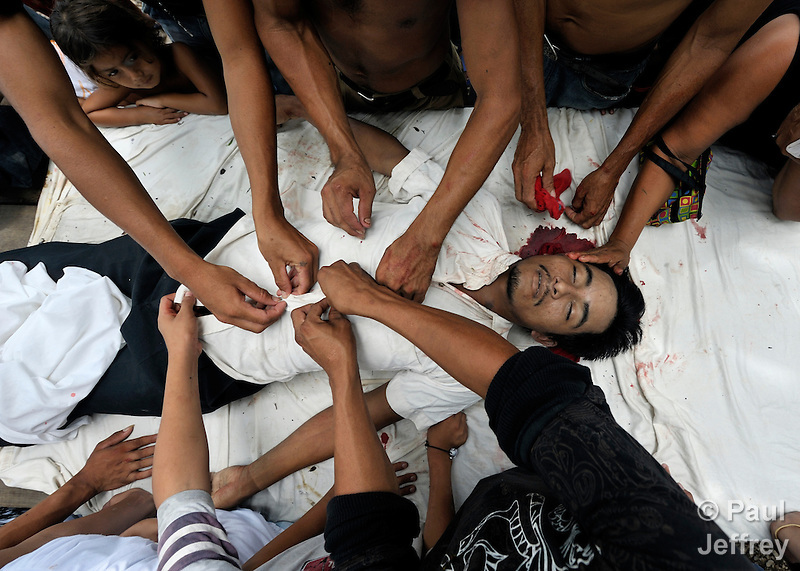 Family and friends dress the body of Carlos Martinez, a 23-year old farmworker who was shot to death on October 2, 2011 on the La Lempira Cooperative outside Tocoa, Honduras. Martinez and other members of the cooperative are among thousands of Honduran activists who have seized plantations they claim were stolen from them by wealthy Honduras businessmen. Day 24: Joy. 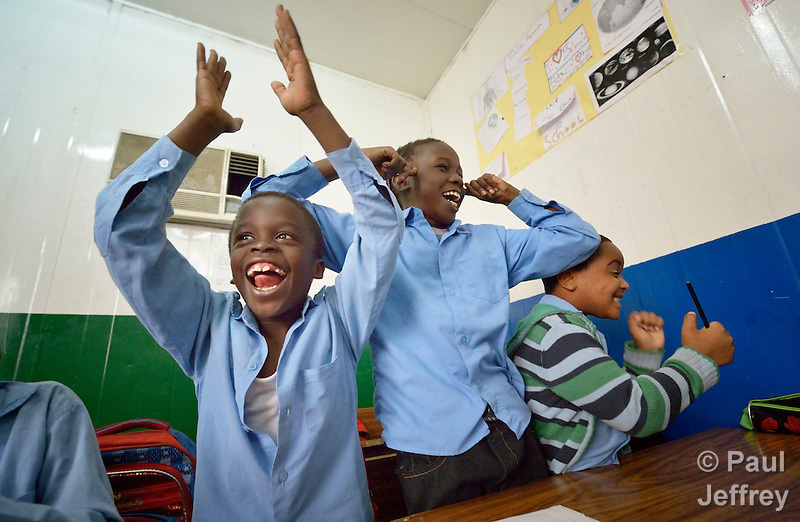 Refugee boys celebrate winning an in-class competition in a school operated by St. Andrew’s Refugee Services in Cairo, Egypt. Day 25: Light. 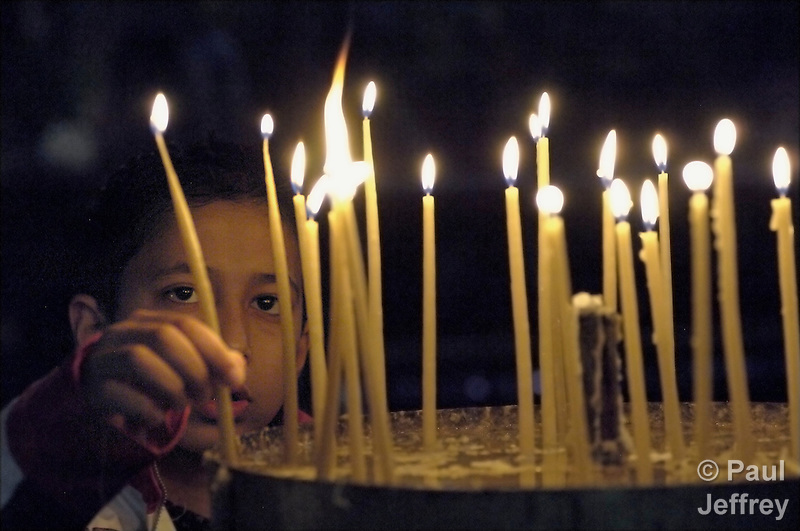 A boy lights candles in Bethlehem’s Church of the Nativity, inside the occupied Palestinian West Bank. 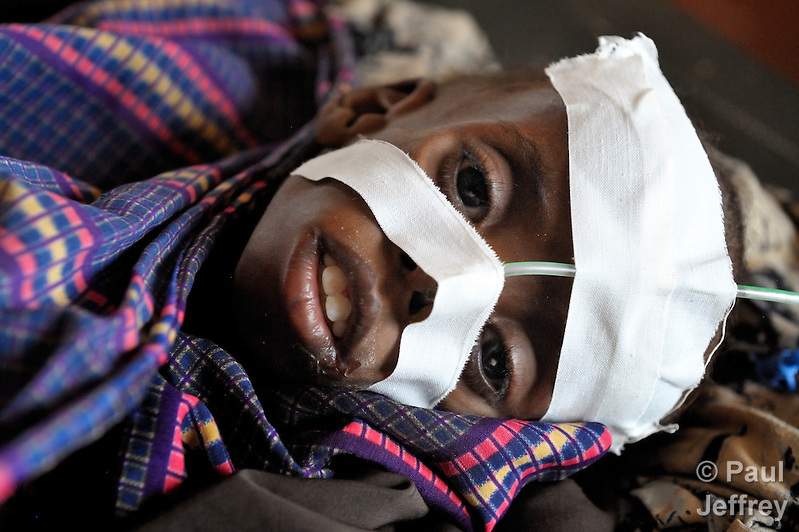 December 24, 2013 | Filed under Africa, Americas, Asia, Blog, Children, Church, Disasters, Europe, Faith, Fun, Photography, Refugees, Uncategorized, War, Women. So moving. Some images brought tears to my eyes. Others made me snicker. Thank you and Merry Christmas. Although Christmas has gone past looking thru these pictures made me realize the world exists; not just my comfortable little home where everything is a struggle yet the Lord provides and we are blessed. I am so glad I took the time to look at these Advent pictures; its an eye opener. Made me realize that suffering is real it happens somewhere around the world at every moment. Thanks for those most realistic pictures of God’s children.